Welcome to the AmericInn Lodge and Suites Medora, North Dakota the ideal location for your next stay, whether you are traveling for business or pleasure. We are proud to provide the amenities you want most and deliver them at the highest level possible starting with comfortable, quieter guestrooms. Our Medora hotel offers a variety of room types including suites with whirlpools. Wake up each morning to our free, hot, homestyle AmericInn Perk breakfast and stay connected with free, high speed internet. 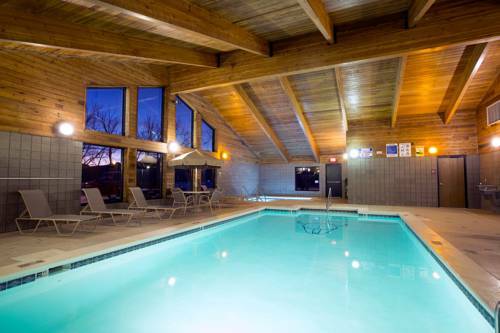 Guests also enjoy our inviting indoor pool, hot tub and sauna. The AmericInn Medora hotel is conveniently located within walking distance of historic downtown Medora. Located at the gateway to the Theodore Roosevelt National Park, let the Medora AmericInn be your host during your western shopping adventures or while you observe firsthand the untouched habitat of buffalo, wild horses, elk, deer and prairie dogs. Our newly remodeled AmericInn is located near Dickinson, Watford City, Beach, Williston, Belfield, Killdeer, Richardton and Tioga. Our 100 percent nonsmoking hotel offers business and Leisure Travelers a desk, free wireless high speed internet access, microwave and refrigerator, 32 inch flat panel televisions, free continental breakfast including hot waffles, biscuits and gravy, eggs, oatmeal, cold cereal and much more. Enjoy our oversized pool and whirlpool area with vaulted wood beam ceiling, comfortable, home like lobby and specialty rooms. Lots of shopping and many sites to see. Nestled quietly deep within North Dakotas badlands lies little Medora, historically restored cattle town surrounded by the natural wonders of the Theodore Roosevelt National Park. Conveniently located on interstate 94 and near the heart of the Bakken oil formation, its old time shopping and restaurants aura is now complete with our newly renovated AAA diamond rated AmericInn Hotel and Suites, lodge styled yet specially appointed in the very latest comforts and luxury of today. Medoras newest and largest year round hotel and conference center. A formerly famous (and now stuffed) two-ton bovine is exhibited in the local historical museum.